In love with Super 8, in love with their local community and in love with each other: For more than a decade, Paolo Davanzo and Lisa Marr have been running the Echo Park Film Center, a small community film workspace and film theater in Los Angeles. Thanks to the Center, kids from their multicultural neighborhood have become the next generation Super 8- and 16mm filmmakers. 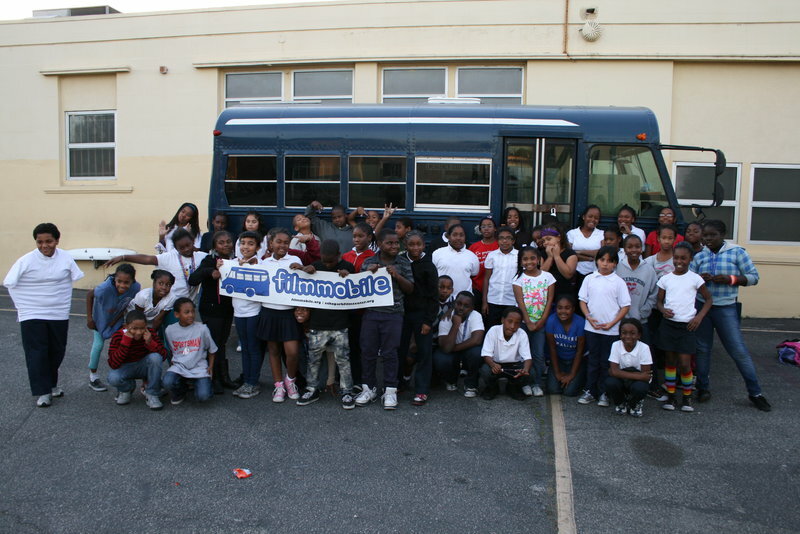 And their filmmobile takes their film activism to the next frontier. An interview. 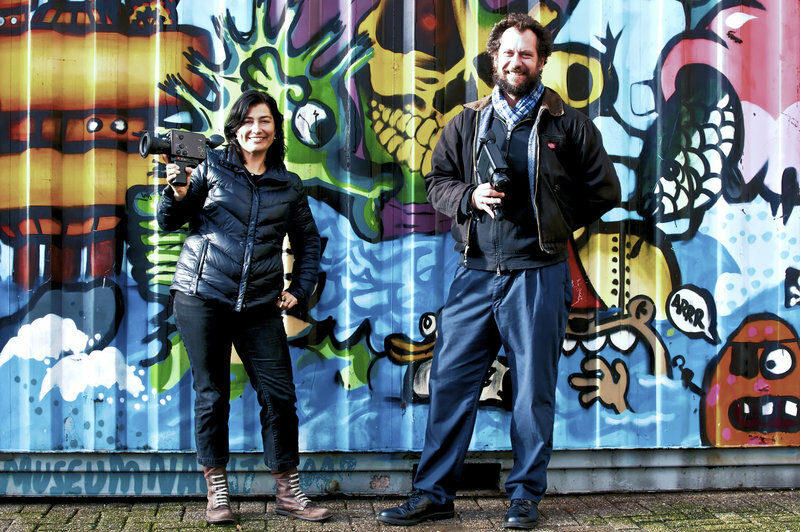 How do you teach Super 8 filmmaking? Lisa: We have been doing free classes for teenagers in the neighborhood since the Film Center began. All the equipment is provided for free, the instruction, anything to do with the classes if free. And it is such a great learning tool because they are forced to really think about their craft and their art and their ideas. It’s not this instantaneous culture that we are so used to. Some of these students fall in love with film and that is their focus for the rest of their lives. For others, it’s just a stepping stone on their way to something else. But everything that they gain through the process helps them in whatever they do: discipline, imagination, planning, the tactile nature of it. It’s really amazing to see these young minds latch on this form. Paolo: Everything we do is not just about the product, it’s the journey. We have these group meetings, with all the families and the neighbors. In the end, we always show the film. Everyone has to bring food. And there are so many different cultures, people from El Salvador, from Mexico, from Vietnam, and they bring cultural dishes from their communities. We share, we watch the film, and it becomes this social endeavor. Were you involved in Super 8 before you began the Film Center? Paolo: My father had a voracious appetite for Super 8. As a kid, watching those films, I was socialized with the beauty of this. But I only bought my own first camera when I was eighteen, at a garage sale, a Eumig. It was in mint condition. This Persian gentleman in Los Angeles was selling them still in the case and maybe used once. And that was when I said that not only I can appreciate looking at this, I can make it, and ended up doing it for more than 22 years. Lisa: He was doing film, I was making music, touring with a punk band all over North America. And then we met. It was those two D-I-Y aesthetics coming together in a new project, the Film Center. Punk and Super 8, that’s really a match, isn’t it? Lisa: Definitely. The first time Dagie Brundert heard my music from the era, the mid-1990s, she said „this is Super 8 sound“ – the equivalent of a Super 8 film but a song. I think it’s because of the hand-made, hand-held aspect to it. Everyone can join in and be a part of and get excited about. It’s a collective enterprise. Lisa: Exactly. It’s not very expensive, it’s easy to find in kind-of thrift stores. I found my first Super 8 camera in a thrift store in Joshua Tree. You can find, and immediately you can get going. You’re making things and learning as you go, there is no preciousness about accessibility or knowledge. It seems very welcoming to people. Paolo: You validate your own creativity, in a sense that you have a Super 8 camera and, boom, you make a movie. In punk, you have a guitar, you know three chords, you make a song. You don’t need a professional venue or a film festival to validate you. Would you say that this has changed? In the 80s and maybe still in the 90s, the easy way to start music was to pick up a guitar and learn three chords, or pick up a Super 8 camera and make a film. But to just quickly shoot things, you would nowadays use a cheap video camera. Hasn’t Super 8 become more crafty and exclusive? Can it still be punk? Paolo: That’s a good question. Lisa: We try to keep it as the punk aesthetic. We don’t want it to become a rarefied art form, we want to keep it in the everyday. But I agree with you: as something that everyone has, that your grandfather and your little brother can use, digital technology is the Super 8 of today. But we do believe that there is something irreplaceable about Super 8. There is this return to craft in all forms, things that are made with your hands, things that are made with the community. People are hungry for that. It’s like the church of our generation, a way to gather people and celebrate something that everyone has a common belief in. There is that conscious community building aspect to it now that maybe didn’t exist before. We don’t want it to become a rarefied art form, we want to keep it in the everyday which is why we teach our students to use it, which is why we encourage our community to use it, which is why we show it as much as possible to say that it’s still a vital art form. it became once again like an outsider art because people were shifting towards video. I think that’s the same thing with punk. Now, if every kind can buy a little crappy cell phone that has a video camera on and all of a sudden becomes a cultural producer, at least a content producer, but it doesn’t have that same kind of outsider aesthetic to it. And to see a child at the Film Center that has not even a conception of how motion picture works, for them to touch it, and feel it and even lick it – that’s the magical physicality of it. Lisa: Our students get very excited about it. They talk about it in these ways: „This is more real to me, this is more powerful, this is more meaningful“. And they have this real desire to continue to explore that craft. So would you say that Super 8 culture has gone full circle, that it is now becoming one with the old amateur culture. The punks were anti-establishment, and the typical punk filmmaker would be the anti-family filmmaker, but now they are one family? Paolo: Exactly. That’s hilarious, yes, well said. Lisa: Yeah, it’s complex, the way these media come and go in our culture. On the one hand, you do sociocultural work, but on the other hand you are also internationally known as a workspace for experimental filmmakers. How do these two sides match? Lisa: I think that we are one of the few cinemas that encourages people from all walks of life to come and participate. Most cinemas are catering to a student audience, some sort of intelligentsia. But for us, literally, you can be sitting with the clergyman from down the street with some punk teenager, somebody’s mom. We even had people come by and say: when you first moved into this neighborhood, I was really resentful – who are these white folks coming in here with their fancy art center? But now I’ve gained access through either my son or my daughter, I’ve come in because I’m interested or there’s a program that’s really about our community. Paolo: Currently in this class that’s starting in a few weeks, everyone of the teachers is a former student. We have four teachers, and that’s an amazing social and educational model. We have some kids now who are in pretty prestigious art schools. So, who knows, in ten years, they may be running Warner Brothers, but that’s not our concern. Isn’t there contradiction between seeing Super-8 as a DIY medium and teaching it? Lisa: … all these things. There has never really been one about Los Angeles which was interesting – aside from Tom Anderson’s „L.A. plays itself“ that’s a kind of a modern version of it. And then we introduced them to 16mm technology. None of them had ever shot it, none of them had ever seen 16mm film, and they were sent out to create a 24 hour meditation on Los Angeles. There were about 48 students. They were paired up, each student chose an hour of the day, and they were given up to two rolls of 16mm film. It had to be black and white, and they had to select a portion of the city that they thought represented L.A. at that particular time. Obviously, it was silent, they each worked on their minutes. Each hour was condensed into a minute, so it ended up being a 24 minute film. It started at midnight, finished the following midnight. We had a live score provided by a local experimental ensemble. It had its debut in a large theater in Downtown Los Angeles. It was just completely magical. Paolo: The majority of our staff works volunteer. However, since our inception we have always paid teachers, filmmakers and visiting artists. We feel it is important to nurture the system and reward those who are making work. The funding stream in the US with non-profits – or NGOs as you may say – come mostly from foundations. We get most of our funding from large foundations that by-law need to give a percentage of their funds to groups working in the community. We also get grants from the government. However, that is a tiny percentage, maybe ten percent. We rent film and video gear and do repairs. That creates some funds, maybe twenty percent. Lastly, we charge for the cinema events and that raises maybe twenty percent. Isn’t the fundraising a never-ending chore for you? Paolo: In the beginning it was struggle as we had no money and had to always hustle for some dough. However, now we have built a name for ourselves in Los Angeles and people truly appreciate what we are trying to do. So bit by bit we are able to get funds. Never a lot but always enough. You also run the filmmobile. Did you feel that it was not sufficient to stay in one space? Paolo: Yeah. It’s a combination of our desires and passions. The idea came from Lisa. She was like: We are doing what we are doing, and we can reach more communities, so what if we became itinerant. Lisa: When the Film Center started, every students was really from the surrounding blocks. Now, we have kids coming from far away, being two hours on the bus to reach us. But that’s not what it’s about, it’s about community filmmaking. So the bus serves that purpose. Some of the workshops we do at the bus last literally an hour, and we set up direct animation. We are on a picnic table outside in the park, set up a long strip of film, everybody works on it, an hour later we watch it. That’s probably the quickest workshop we do. How does the bus technically work? Paolo: It’s about seven meters long, not humongous, but pretty big. We tore away all the seats. A friend of us is a carpenter, so it’s beautifully furnished. If we have a very small group, we can work on the bus, if we have a larger group which is normal, we do it in a classroom or a church basement or an afterschool anywhere. We are in process of buying second bus, a hand-processing truck. Then we will have the Filmmobile which teaches the workshops, and the hand-processing bus that can go together. So you can run around, shoot Super 8 and, go into this light-tight bus, process it and then watch it the same day. Lisa: We also use the bus for a screening series where we show films in a location where they were originally shot. So we park it somewhere, put the screen out and attach it the outside of the bus, set up a projector and show it right there. Paolo: Once we used the bus for a guerilla screening on Hollywood Boulevard. There we were at the heart of the Hollywood machine, and we were taking it back. We were showing films from inside the bus, and people were walking by which was a powerful moment. A last but inevitable question: What are your favorite Super 8 cameras? Paolo: I’ve gone through phases: the Eumig, when I first had it, was like the first girlfriend you fall love with and never fall out of love, like that first kiss. But then, I became obsessed with Canon, and now Nizo is what we are using often. Lisa: Yeah, Nizo. It’s all about the Nizo 480 for me, the little one with the „B“ setting.